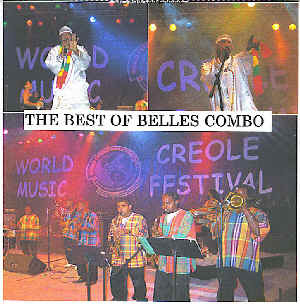 THE BEST OF BELLES COMBO CD is a compilation of the Greatest Hits of Belles Combo,a priceless classic addition to your collection of Creole music. One of the greatest Cadence bands to originate from Dominica, The Belles Combo were reunited at the 8th annual World Creole Music Festival in Dominica on October 31, 2004. This Cd captures some of the memorable hits of the early seventies. Cletus (Halibut)Abraham, the lead vocalist and Mike Moreau on guitar add some delightful displays in songs like "jawbone", "Qui Ca Ou le vieux", "En Meme Tou la","Apres Carnival" and "Mal Elever". The song "Misik A -Nous" is used repeatedly by Dominicans as a Creole Anthem.